This article presents findings from a qualitative study of academic success factors affecting African American male students in the community college. In-depth, semi-structured interviews were conducted with 28 African American male students at a Southwestern community college. 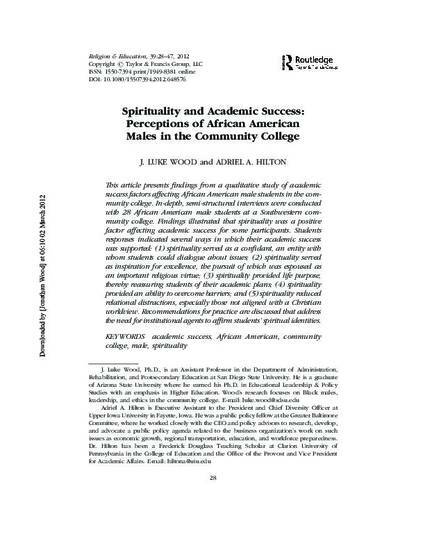 Findings illustrated that spirituality was a positive factor affecting academic success for some participants. Students responses indicated several ways in which their academic success was supported: (1) spirituality served as a confidant, an entity with whom students could dialogue about issues; (2) spirituality served as inspiration for excellence, the pursuit of which was espoused as an important religious virtue; (3) spirituality provided life purpose, thereby reassuring students of their academic plans; (4) spirituality provided an ability to overcome barriers; and (5) spirituality reduced relational distractions, especially those not aligned with a Christian worldview. Recommendations for practice are discussed that address the need for institutional agents to affirmstudents’ spiritual identities.